2. Place the chicken strips in an ovenproof dish. Heat the sauce in a small saucepan and pour over the chicken. 3. 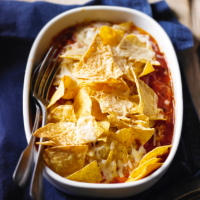 Sprinkle over the cheese then the tortilla chips and bake for 20-25 minutes until the chicken is cooked through with no pink meat and the juices run clear, then serve.